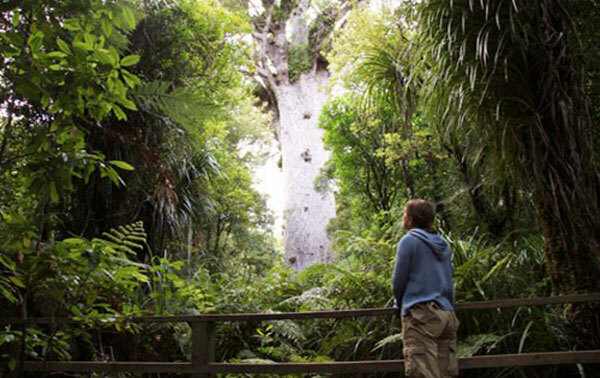 Tane Mahuta is New Zealand’s and the world’s largest Kauri Tree. It is located not too far from the road with about a 3-5 minute easy walk. There is a carpark with toilet and picnic facilities, and getting there is signposted from State Highway 12. It is about 65kms north of Dargaville and about 18kms south of Opamare. Tane Mahuta “lord of the forest” is estimated to be 2000 years old, and dates back to the birth of Christ. It is 51.5 meters tall and has a girth of 13.77 meters. It is very important when taking the walk to Tane Mahuta that you stay on the track. Kauri Trees have very sensitive roots and they can be easily damaged by tramping on them. There is also a disease killing our native Kauri, called Kauri Dieback. We can help stop this disease by cleaning our shoes before and after visiting Kauri trees. Humans are the number 1 cause of spreading the disease. There are a number of walks of varying degrees in this area ranging in time from 5m through to 1.5 hours. Plan to spend a little time hear as if you are up for the challenge it can be quite rewarding.